Camaguey will enchant and seduce you! It is a UNESCO world heritage site and one of the seven founding cities of colonial Cuba. It is also home to some great artists. Works of art are everywhere! 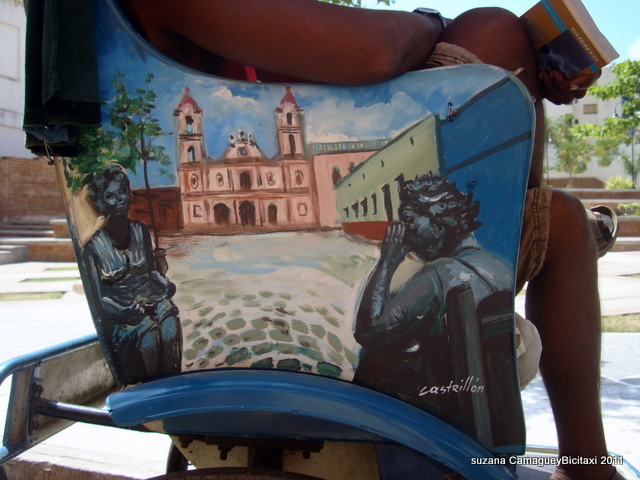 Camaguey oozes art! 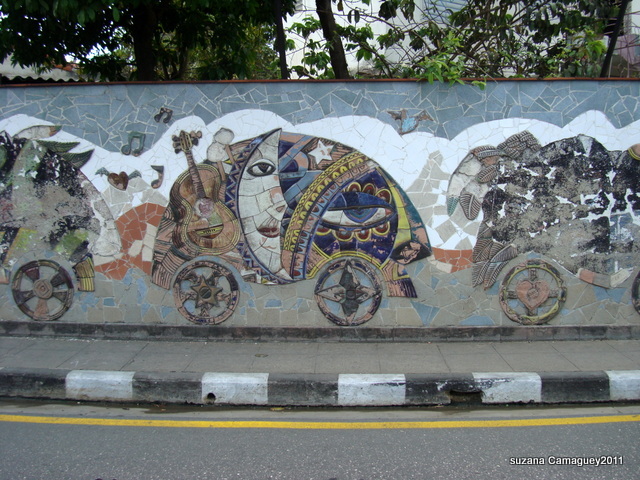 Paintings and reliefs are worked into the walls, and art is embraced by young and old in the many parks and street corner installations. Outside her studio, in plaza del Carmen, a number of life size human figures cast in bronze depict life as seen through her eyes. Her open studio is a delightful gallery of both 3 dimensional and 2 dimensional works, spanning many years. Her life size figures in the plaza are what catch your attention and everyone enjoy the interactive quality of these pieces. 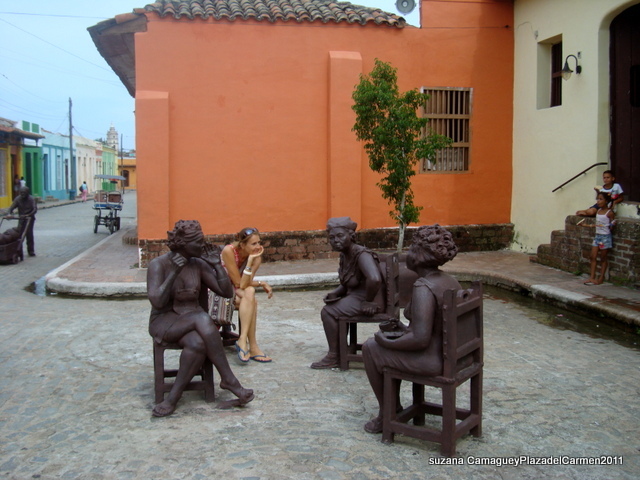 Situated in front of the Church of Carmen, where she grew up, her sculptures have become the more popular attraction! Her model for the man sitting reading a newspaper often arrives in person to sits beside his bronze double and of course loves to be photographed adding a 4th dimensional twist to the pose! The group of three gossiping ladies are perhaps a little more discrete, but the empty chairs in this group invite you to join the circle and pass on the local news!!! 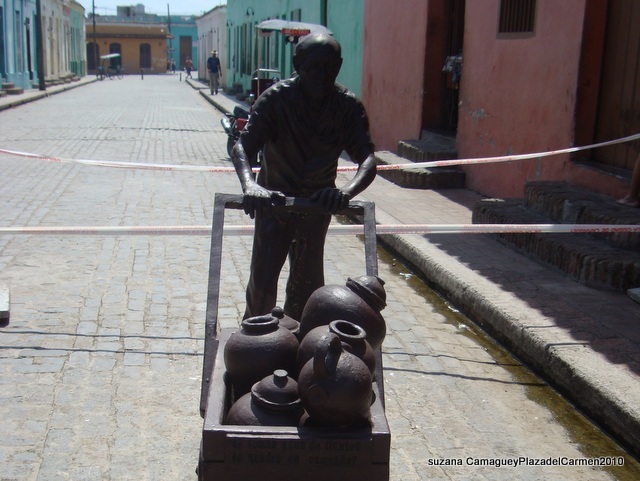 Camaguey is famous for its huge water jars and another figure on the street is the old man who delivers water in jars. Sadly he is dead now but his bronze self reminds everyone of their history! 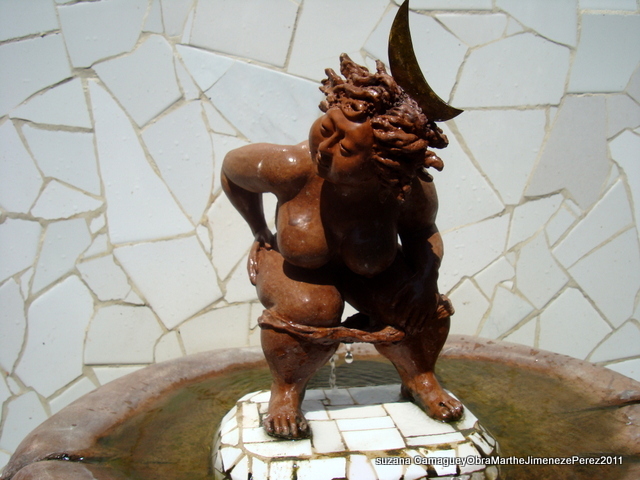 Much of Martha’s work revolves around the role of women in Cuban society and in the world at large. 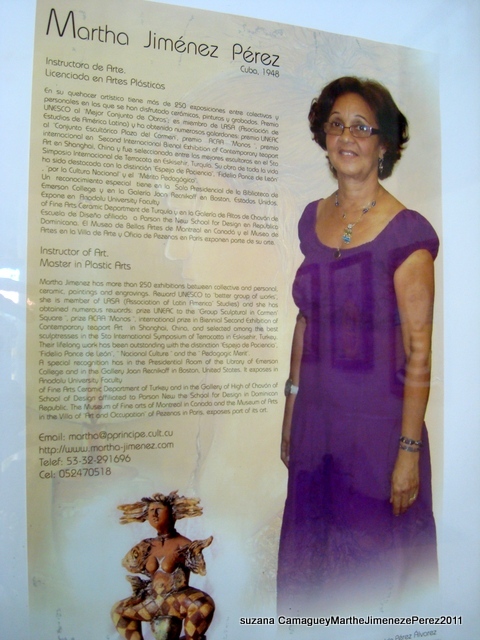 Martha has been honoured by leading Cuban art critics and has received prestigious awards for her work. The plazas main focus is the twin towered church of Carmen built in 1823 – 1825, and the convent of the Ursulin order adjoining. Post revolution and the banning of religion, all these historic buildings fell into disrepair and ruin. This building and church has recently been restored thanks to the UNESCO award! You can imagine what a delightful place it is to stop and pose for photos! 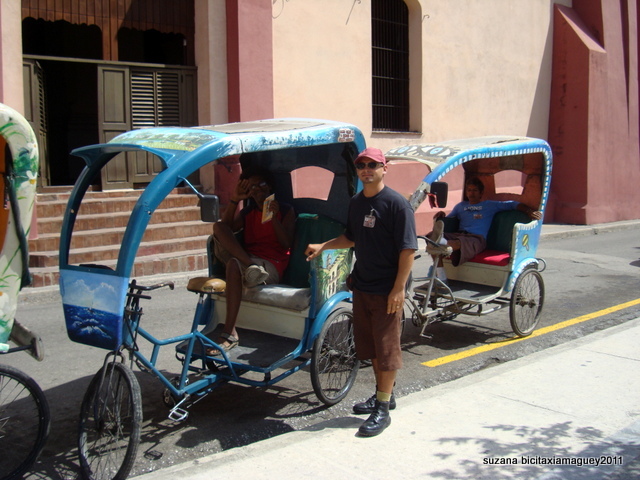 The best way to tour this historic city is by bici taxi who will take you to all the historic sites. The winding streets make finding your way around somewhat difficult and your driver will be able to tell you proudly about his home town! 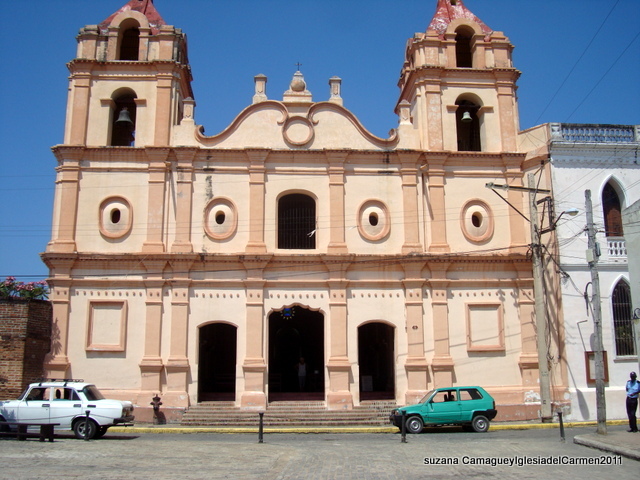 Luckily for us Camaguey received a UNESCO world heritage site status and the historic centre has been improved and maintained to preserve its colonial and pirate past! 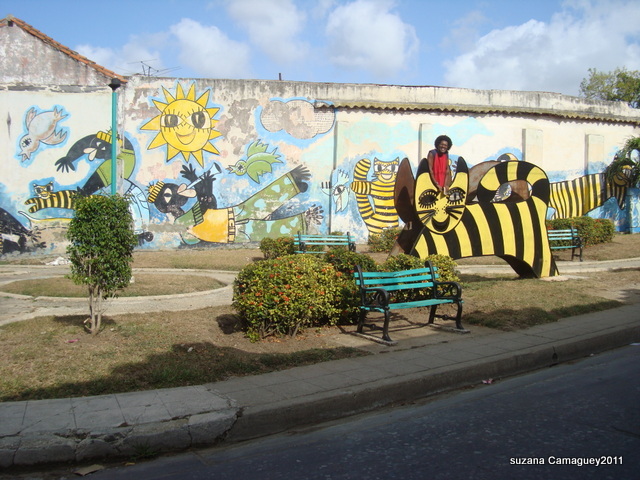 Why not book your tour “Mi Cubita” and enjoy Camaguey for yourself!